Soccer News I.V. - It's in your veins! Looking for a quick infusion of news about all things affecting US soccer? Then check out the Soccer News I.V. podcast, brought to you by SoccerROM. To get started, simply download the latest podcast, then play it directly from your computer or synch it to your iPod to listen while "on the go"! Each podcast is enhanced with an embedded "slide show" that corresponds to the audio broadcast. You can view the video portion of each podcast in iTunes by opening the artwork/video viewer in the lower left corner, or by playing the podcast in the QuickTime player (version 7 or newer required). Want more? Check out previous editions of the podcast at the links below! Stephen Parr has worked in film and television since 1995. His credits include technical advising for (and appearing in) Disney's "The Big Green", producing and hosting Soccer News Net (a 13-week series on MLS and the Dallas Burn for the PAX affiliate in Dallas), and working in television news since 1998. He currently works for KSLA, the CBS affiliate in Shreveport, Louisiana. 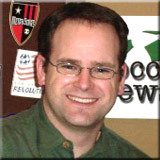 He has also worked at KLTV7, the ABC affiliate in East Texas, and KXII, the CBS station in Sherman, Texas. Stephen has won Honorable Mention for the Texas Associated Press for General Assignments reporting, and he has produced and hosted numerous 30-minute news and weather specials for KLTV7. Stephen currently holds a National "C" Level Coaching License from the U.S. Soccer Federation, and you can reach him at sniv@mac.com.